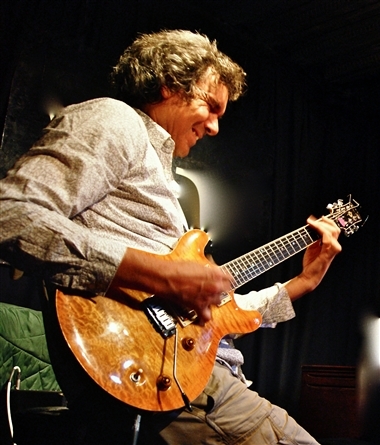 John Etheridge is an English jazz fusion guitarist known for his eclecticism and broad range of associations in jazz, classical, and contemporary music. He began playing at 13, his early influences being Hank Marvin of The Shadows and Django Reinhardt. Although his father was a jazz pianist, he was primarily self-taught. In the mid 1960s he formed his first notable band, Rush Release. The band was formed at the height of the British ‘blues boom’, with the emergence of guitarists such as Peter Green, Jeff Beck and, later, Jimi Hendrix. Etheridge played with Rush Release at London’s Speakeasy Club in 1966, and on occasion would jam with other guitarists on the scene such as Eric Clapton. In 1975 John took over guitar duties in Soft Machine from the late Allan Holdsworth. He still plays in Soft Machine Legacy to this day, with a line up consisting of players from various incarnations of the band. During the late 70s he began what would become a long-term collaboration with French violin legend Stéphane Grappelli, with whom he performed on numerous world tours between 1976 and 1981. In 1992, he joined violinist Nigel Kennedy’s live band, playing on his albums Kafka (1996) and The Kennedy Experience – The Music of Jimi Hendrix (1998). The same year he released his first solo album, Ash, Subsequent solo albums included Chasing Shadows (2001), I Didn’t Know (2004), Stitched Up (2006, with his Trio North), In House – Live In London (2007, with Arild Andersen and John Marshall), Alone – Live ! (2008) and Break Even (2008, with Liane Carroll). In recent years, John has been nominated for ‘Musician of the Year’ at the Parliamentary Jazz Awards three times (in 2005, 2006, and 2011). John’s versatility can be best summed up by the fact that he has toured as a duo with legendary classical guitarist John Williams and in 2014 with hard rockers Hawkwind. In 2016, John teamed up with jazz singer Vimala Rowe to release the collaborative album Out of the Sky, which explores a range of jazz, flamenco, Indian classical, traditional African, and blues influences. 2018 started with John on tour with another of the great names of progressive rock, Caravan.